MERCERVILLE — Gallipolis-based attorney Jason Holdren spoke with South Gallia High School students Wednesday morning about the U.S. Constitution’s Fourth Amendment rights. Holdren, of Crown City, is a Republican hopeful vying for Gallia County Prosecutor in this year’s November general election. Holdren was invited by school representatives to take part in a lecture aimed at informing students about their rights when interacting with law enforcement. Holdren covered such things as Miranda rights, search and seizure techniques, a quick synopsis of how warrants work, who could be blamed for possession of drugs in vehicle searches, as well as legal definitions and more. In Mrs. Dafney Davis’ AP government class, hosting roughly 20 students, Holdren spent an hour lecturing, questioning and answering questions from students. Candy was passed out to promote participation and reward discussion. Holdren started by asking students if they had ever been pulled over by a law enforcement official. Those who had encountered police raised raising their hands. He then introduced himself to students as an individual who has had prosecuting and criminal defense experience. “I’ve seen how both sides of this (criminal law) works,” Holdren said. Students shared personal experiences with law enforcement and Holdren explained legal perspectives of the proposed scenarios. Holdren showed students short videos of police interacting with suspects, as well as another detailing a police drug raid. Holdren informed students as to the particulars of what they could expect in regards to their rights to privacy in searches. According to Holdren, one important piece of encouragement to students was to never drive a friend’s car without first inspecting it. If an individual is pulled over driving another person’s vehicle and illicit items are discovered, the individual driving could be held legally responsible for the items’ presence. He also advised students that it was their right to not give consent to police searching their vehicle and that police must have probable cause to initiate a search. Holdren encouraged students to be cooperative and respectful with police, but they should have a clear understanding of their Fourth Amendment rights. 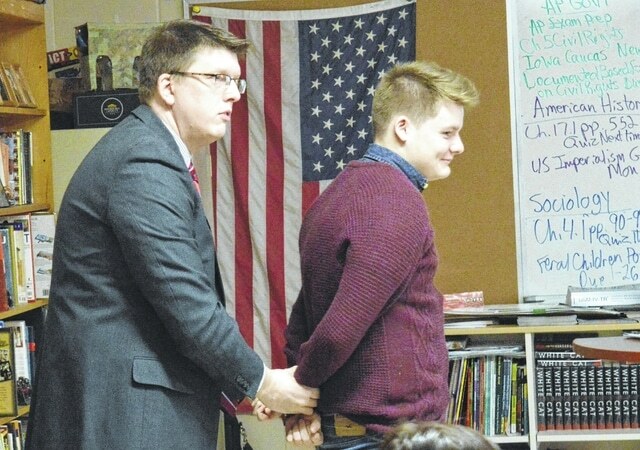 Attorney Jason Holdren, of Crown City, demonstrates and explains arrest and search laws Wednesday with South Gallia High School students in Mrs. Dafney Davis’ AP Government class.